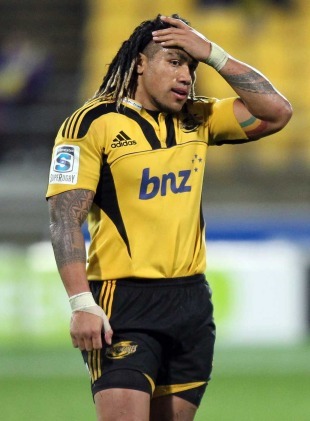 All Blacks and former Hurricanes midfielder Ma'a Nonu has re-signed with the New Zealand Rugby Union (NZRU) for two more years and also signed with the Blues Super Rugby franchise. The 29-year-old Nonu has signed for the 2012 and 2013 seasons and will also take a playing sabbatical from New Zealand rugby at the end of the year, joining the Ricoh Black Rams in Japan's Top League competition for several months before returning to for next year's Super Rugby competition. Nonu, who found himself surplus to requirements at the Wellington-based Hurricanes after failing to earn a new contract beyond this season, was delighted to ink on a new deal. "I'm happy that I'm continuing my career in New Zealand and would like to thank the Blues for giving me the opportunity to join them," the 56-cap centre said in a statement. "I was flattered and grateful to receive offers to play for other teams as well but the Blues was the best option for me and my family and I'm really looking forward to joining them next year." NZRU CEO Steve Tew welcomed Nonu's decision to stay in New Zealand and hailed his signature as a huge boost for rugby in the region. "Ma'a is an outstanding, world-class player who has been committed to New Zealand rugby for the best part of a decade, and for him to commit further is fantastic news," he said. "We have said that we will look to be flexible when it comes to re-contracting our leading players and we think giving him the chance to play in Japan is another example of that flexibility," Tew said. "With the rugby season finishing earlier than normal this year we were happy to provide Ma'a with a one-off opportunity to have a Japanese rugby experience without overly compromising his commitment to the Blues. Blues coach Pat Lam, whose side face the Reds on Saturday in this year's Super Rugby semi-finals, was delighted to secure Nonu's services. "It's no secret there was a lot of interest in securing Ma'a by teams both locally and around the world. He is a quality player so it's great news for the Blues that he has chosen our team in which to continue his impressive rugby career." Nonu, who racked up 110 Super Rugby matches in nine years with the Hurricanes, joined a growing group of current and recent All Blacks who have recommitted to New Zealand rugby after this year's Rugby World Cup, including captain Richie McCaw and playmaker Daniel Carter, hookers Keven Mealamu, Corey Flynn and Hikawera Elliot. The All Blacks most capped prop Tony Woodcock and fellow props Ben Franks and Wyatt Crockett, locks Ali Williams, Anthony Boric, Tom Donnelly and Samuel Whitelock, loose forwards Jerome Kaino, Kieran Read, Daniel Braid, Liam Messam and Victor Vito, and backs Jimmy Cowan, Alby Mathewson, Colin Slade, Conrad Smith, Benson Stanley, Ben Smith, Israel Dagg and Aaron Cruden have also put pen to paper with the NZRU.